Based in Denver, CO., Solace Healthcare delivers children’s home care services in a supportive, caring and fun setting. Their mission is to provide the highest quality of home care services to children in need, so children can have the highest quality of life. Although currently specializing in pediatrics, Solace has a long term goal of expanding to adult and geriatric services. Solace Healthcare is accredited by the Accreditation Commission for Home Care (ACHC), licensed as a Home Care Agency by the State of Colorado, and is a certified provider for both Medicare and Medicaid. Following an unsuccessful first attempt to implement a cumbersome electronic health records system (EHR) system, the agency instead created a system of disparate electronic spreadsheets that clinicians updated accordingly after each patient visit. The spreadsheet approach was awkward, unwieldy and presented its own unique challenges. In addition to numerous data entry errors due to the manual transfer of information to the billing department, field clinicians often worked blindly because they could not easily access physician orders, visit notes and progress reports from other clinician visits. Compliance was an ongoing issue as clinicians searched multiple documents, sometimes up to 20 spreadsheets, to fully document the care plan. “When audits occurred, it was ‘all hands on deck’ to find the necessary information and prepare for the auditor,” explains Darcie Peacock, administrative director of the agency. Solace wanted a comprehensive home health electronic health record (EHR) system that would ensure that their clinicians were fully compliant with physician orders. They desired a robust system that would automatically generate the Home Health Certification and Plan-of-Care documents, enabling clinicians in the field to document at the point-of-care. 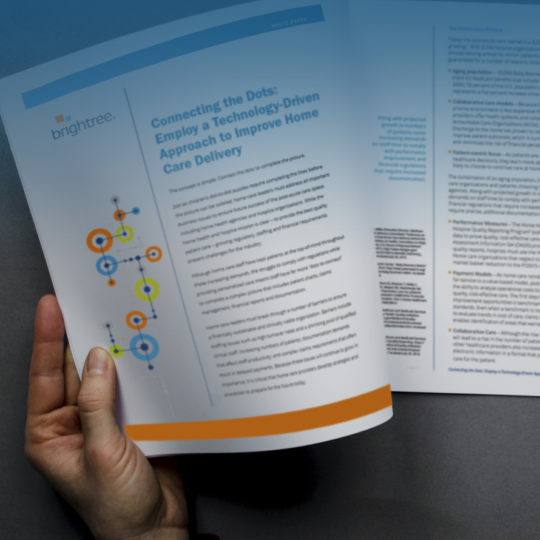 Solace selected Brightree Home Health software for its compliance capabilities, secure access to patient records, and operational efficiency. With Brightree Home Health software, Solace is easily able keep up with physician orders by having access to the patient record in one accessible, secure cloud-based location. All clinicians in the field are enabled to document at the point-of-care (POC) and can access patient information without searching multiple individual spreadsheets. They have eliminated the need to rekey information into the billing system which has avoided unnecessary data entry, eliminated errors and has enabled an efficient billing process. Brightree Home Health streamlined the workflow so significantly; the clinicians thought they must be missing something. With the ability to document offline at the point-of-care, clinicians can easily synchronize patient information to the centralized EHR and now have their nights and weekends back. Brightree Home Health has enabled Solace to realize efficiency gains with streamlined processes and improved workflows. At intake, Solace can get patients up and running faster. Prior to using Brightree Home Health, order processing took approximately two (2) weeks, now it is the same day. The intake process consisted of manually entering patient information into four (4) different systems that required a significant amount of time to check orders and follow-up. Now with Brightree, the intake process is a simply click and add. Before, evaluations and ongoing services took 2-3 weeks, now they are processed the next day.